There are certain stocks in which your overriding first impression of checking out the fundaments is one of complete awe. Visa and MasterCard are two such businesses in that the almost mind-boggling levels of profitability jump right off the screen when you see all the major fundamentals laid out in front of you. We’re talking about businesses that send around 35% of their net revenues straight to the bottom line due to the strangle hold that they have on global payment processing. In the case of credit cards around 68% of total payment volumes in the United States belong to either Visa or MasterCard. For debit cards the comparable figure is around 94%. The great thing about the business model is that it’s a pure toll both operation with no credit risk. Admin expenses, advertising and taxes are their largest outlays, and with minimal need to reinvest in the underlying business you end up with two absolute compounding machines. To get some idea of what that means in practice consider that over the past five financial years Visa has converted a shade under 40% of revenue into free cash flow. The comparable figure for MasterCard is around 36%. The two things (probably) preventing them from being buy-and-hold forever stocks? Technology and litigation. With the former you always run the risk that some disruption will render the current business model obsolete. You can be reasonably confident in assuming Coca-Cola will be selling Cokes fifty years down the line. You’ll probably feel less confident dealing with the intricacies of payment processing. On the latter point regarding litigation you’ve also just got to reconcile the fact that by their inherent nature these two companies will always be open to accusations of anti-competitive practices. Balancing that out on the other side of the equation has been investors’ initial overestimation of these two headwinds and not paying more attention to the “here-and-now” insane business economics. I stress the word initial as their current valuation no longer lends itself to that claim even though you had it occur around the time of their respective initial public offerings (IPOs). Let’s start off with MasterCard stock, which first listed as an independent publicly traded company in 2006. On the day of the IPO itself MasterCard stock began its trading life at a then share price of $39. Adjusting for the 10-for-1 stock split that took place in early 2014 that works out to an initial share price of $3.90 in today’s currency. 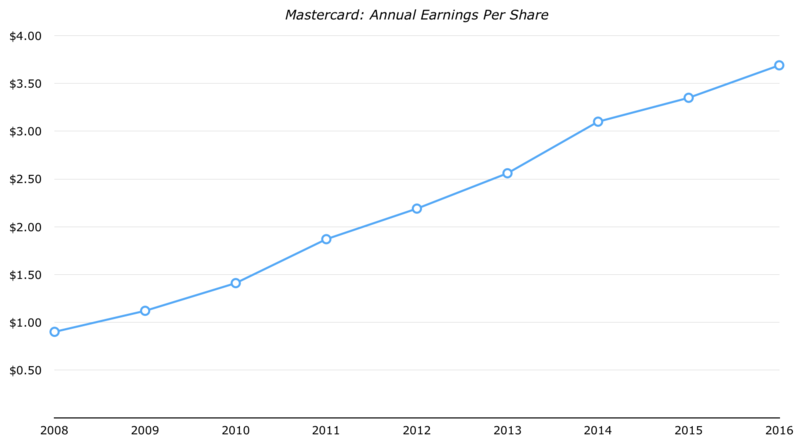 Over the full year MasterCard would go on to earn adjusted net income of $0.34 per share. Now with the full benefit of hindsight you get to appreciate that as gift pricing. Compare it Google which IPO’d a 58x earnings back in 2004, or more recently the Facebook IPO which put the stock at around 85x earnings. The reason for MasterCard’s relative cheapness? Partly down to fears that litigation would hold the company back. In the years that followed you’ve seen split adjusted earnings per share rise from $0.34 to around $3.70; the first full year (2007) annual dividend of $0.054 per share has now become $0.76 per share; and the initial IPO market-cap of just $5 billion has now ballooned to around $115 billion. What if you were a shareholder during that time? Well, let’s say you only got in at the end of the first day of trading. That’s after the shares had already risen some 18% as investors were eager to get their hands on the stock. Between then and now you’d have compounded you wealth at a rate of 34.6% per annum assuming the roughly $2.45 per split adjusted share paid out in cash dividends was just left to accumulate. That’s the equivalent of turning a nominal $10,000 investment into around $235,000 as of right now. The beauty of those returns? The current dividend yield on cost would be in the region of 17%. Pretty impressive for a stock whose average annual dividend has never been above 1% since the year of the IPO. Imagine if you were worried about litigation and some new payment processor completely disrupting the current business model. You could simply take that $1,700 worth of annual dividend cash for every initial $10,000 invested and diversify into high quality blue chips of your choice. That’s not all though, as MasterCard are currently growing their earnings and dividends at a double digit clip whilst still only paying out around 20% of said earnings as cash dividends. In the case of Visa’s IPO the returns are a bit less dramatic as the starting valuation was more sensible. The stock began trading in March of 2008 at a then share price of $44. Back in the first few months of 2015 the company carried out a 4-for-1 stock split so let’s call the IPO price a split adjusted $11 per share. 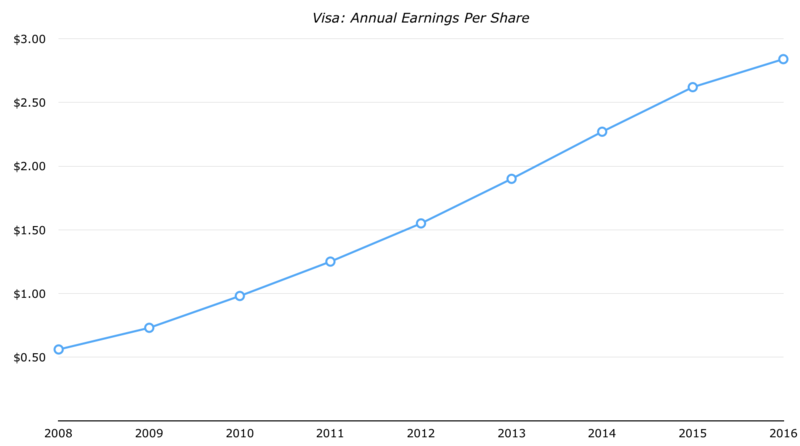 Over the first full financial year Visa brought in $0.56 in earnings per share. The actual starting IPO valuation was therefore around 20x full year earnings. In the years that have followed annual earnings have grown to $2.84 per share; equivalent to an average annual growth rate of around 22.50%. A $10,000 invesment made just after the IPO (after the shares already rose 25%) would currently be worth around $57,000 assuming the dividends were left to pile up. Due to the technology risk it’s likely they won’t be core stocks that you’d reserve for the Coca-Colas, Hersheys and Colgate-Palmolives of this world. These are what I’d call the tier-one stocks in that have built up gobs of brand equity tied to specific physical products. You can say that they’ll still be selling their sodas, chocolate bars and toothpastes forty or fifty years down the line. You don’t get to say that with Visa or MasterCard, even if the technological disruption fears get overcooked in the short run. On the flip side you don’t wake up one day and find out your Visa debit card no longer allows you do a grocery shop. It’s a gradual change that has plenty of forewarning. At the same time their growth rates mean they still carry highly attractive medium-term characteristics even at inflated values. At the end of the day if your more “speculative” holdings end up being as high quality as the global card issuers then you should do just fine.